Dull Subjects | Scott Davis, Marketing PhD student, shares thoughts on services marketing, social media, SEO, internet marketing, and other ideas. When someone asks you if you want to see how the Mad Dog lives, you say no. 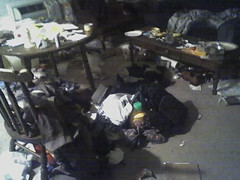 Anyone who has ever accused me of being messy really needs to visit the apartment we went to on Saturday night. Will and I were at our usual haunt in Greensburg, and ended up hanging out with a couple of waiters. We stopped by one of their apartments and stumbled onto a scene out of Texas Chainsaw Massacre. The wadded sock that was stuffed where the doorknob belongs should have signaled what we were going to see inside. The pictures don’t begin to explain this post-Katrina replica. The funniest sight might have been the vacuum cleaner in the corner. As if the scenery wasn’t enough, we were introduced to plate baseball, an interpretation of America’s pastime that involves throwing dishes in the air and breaking them with a hand ax. There was also buck knife twirling and swordplay afoot. Needless to say, we got out of there pretty fast. Now, if you’ll excuse me, I’m going to go see what I find with this lice comb.